Memory Card Drive "expressP2 drive"
The card slot accommodates an expressP2 card, P2 card or microP2 card (adaptor required). The AU-XPD3 contributes to speedier 4K/high-frame-rate video production workflows using VariCam. 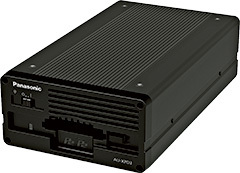 The high-speed Thunderbolt™ 3 interface incorporated in the AU-XPD3 is capable of transferring data at a maximum speed of 40 Gbps, which is eight times faster than the transfer speed of USB 3.0, and also supports daisy-chain connection of up to six devices. As a next-generation standard interface, it is used with many Windows PCs and Mac computers, and its application is expanding widely into various products, such as hard-disk drives and other storage devices as well as Thunderbolt™ 2 conversion adaptors. The AU-XPD3 supports daisy-chain connection. When two expressP2 drive units are used to simultaneously access two expressP2 cards, the transfer speed increases to 17.6 Gbps*2 maximum. (measured value). * The AU-XPD3 dose not support CPS (Content Protection System). *1: The actual data transfer speed and data transfer time depend on the system performance. *2: The actual data transfer speed and data transfer time depend on the system performance. *3: A transfer speed of 10 Gbps is attained only when the expressP2 card B series is used. When another type of P2 card is used, the transfer speed is restricted by the transfer speed of the P2 card used. *4: Available with the latest driver software (P2 driver).